It’s term paper time and you’re looking for help. The clock’s ticking and you have 12 pages to go. Your research has not gotten off to a great start, you’re struggling with a thesis , and now you’re getting desperate. You know a few things: 1) you’re not going to finish on your own, and 2) the Internet is a great repository of term papers for sale, where people in your shoes can go to buy term papers online or find a term paper editing service. The problem is: who can you trust? You don’t want to cheat—but at the same time, you recognize that you require some assistance. All you need is someone to show you the way—so you can see how a different person would write this paper if he or she had to do it. Why? Simple: We learn by way of example. And that’s why we’re here: to give you that example. We don’t just dig down into a stash of essays that we have lying around on hand. We take the precise parameters you provide and show you exactly how your term paper could look. We research it, write it, and give a complete list of references. Not sure how to format it? We’ll show you how. Not sure how to structure it? We’ll give you a plan. Know what you’re after but can’t pull it together? Allow us. We’re one of the most trusted names in the business because we recognize your constraints and provide the product you need to get your term paper out of its rut. Our solution is to provide clients with a 100% original, researched model essay, specifically constructed to meet your needs. A term paper is the culmination of your time in class. Over the course of the school year, you’ll learn all about the subject you’re studying. The term paper is the essay in which you combine everything you’ve learned and use it to write about a topic drawn from the course. For example, if you’re taking a class on the Cold War, your term paper might focus on the career of a specific agent, like James Angleton, or on a theme—like the effectiveness or ineffectiveness of counterespionage in the post-War world. A term paper is like any other kind of lengthy essay or research paper. The difference is that a term paper will draw mainly from sources focused on during the course. So if the professor expects you to use specific books as supplements to your research, you should be sure to include these works in your paper. Whatever themes are touched upon in the course should be themes that are touched upon in your paper. The themes that are brought up in class are important because they are the ones you’re likely to be expected to think more deeply about and address with substantial consideration in your term paper. In other words, the term paper is where you show that you’ve been paying attention and have really taken to heart all that’s been given you over the weeks of various lessons. So now you’re thinking: If I’ve been to the class and am still struggling with my term paper, why should I expect some writer who’s never been to the class to be able to do it? The fact is—our writers are professionals. They’ve written extensively on virtually every subject and have been doing so for years. You’ve heard of angel investors? You can think of us as angel writers. Just like you do when you say your prayers at night, letting the angels know your troubles and asking for their intercession, you let our writers know what the course has focused on—uploading a course syllabus is usually a good way to start—and then let us do the rest. In a way, we have the advantage of being at one remove from it all: when you’re too close to something, it can be difficult to see the right way forward. Our writers see the facts, sum up the situation, and get to work providing a model term paper that can show you exactly which path to take. The parts of a term paper typically include a title page, may include a table of contents, will always have an introduction, will likely be formatted so as to have sections or chapters and sub-sections and sub-chapters, and will always close with a conclusion and a Works Cited, Bibliography or References page (depending on the citation style used). The term paper is typically expository in nature. That means you’ll need to have a thesis, or main idea, that is communicated early on (hint: use your introduction to set up your thesis and state the thesis explicitly at the end of the introduction). Don’t get too crazy with your thesis because—remember—you still have to prove whatever point you’re making with it. So for instance, if your thesis is that James Angleton was really a co-opted double-agent working for the Mossad, you’ll have to prove it. To prove it, you’ll have to do the research! The term paper should include an introduction, a main body, and a conclusion. You’re more than likely going to want to break your term paper up into sections. You can use chapter headings or section and sub-section headings, depending on your own preference. You might also want to include a Table of Contents that can help the reader see what’s in store. Keep it clean and snazzy and your paper will score big with your professor. Make sure every section or chapter underscores the main idea expressed in your thesis, and you’ll have a winner. When Steve Bannon wanted to put out material that would undermine the Clinton campaign during the 2016 presidential race, he turned to a host of researchers at the Government Accountability Institute (GAI). Unable himself to dedicate the time and energy to researching the facts on the Clinton Foundation and the cronyism and kickbacks associated with it, Bannon turned to a team of specialists—individuals who could commit full-time to researching the Foundation and put it all down in writing. The end result was a number of articles and publications like Clinton Cash, which focused on the role that foreign governments played in the Clintons’ wealth-creation. These writers and researchers did the job that Bannon himself could not—and the outcome was a total success: he saw the way forward. You know what you need—a road map for how to write a great term paper—and we provide the arsenal to get it done. It’s like walking into a shooting range for the first time: you bring the guns and ammo, we just give you a demonstration on how it all works. When it comes time to firing at your target, you’re the one who will be pulling the trigger. The best businesses are those that respect the rules. We not only respect them—we live by them. That’s why our customers come back again and again: they know they can trust us. Our writers know how important it is to be original. They work hard to make sure you get unique content every time you place an order. Nothing’s worse than thinking you’ve got a new take on things only to discover that someone else has already beaten you to the punch. The same ideas might still be expressed, but the way in which they’re expressed can spell all the difference between a great paper and one that’s just mediocre. Our writers always strive for greatness. They can’t help but do otherwise: it’s why they love to write. Is it ethical? Yes, of course! The “learn-by-example” approach is a common strategy used by teachers at all levels. In fact, without a proper demonstration it is often impossible for someone to know what’s expected of them. That’s why our service is no different from that which you pay to get in the classroom. We’re just an online organization offering the same thing in a customized manner. Think of it as learning that is tailor-made for you. Will someone know I used this service? Even though it is 100% ethical, we understand that some customers want to keep it private that they have reached out for assistance. While we believe it’s nothing to be ashamed of, we also respect our customers’ desire for tact and privacy. That is why all the information about yourself that you provide us is kept strictly confidential. We do not publish anyone’s personal information or make it available to any third parties. Can I get in trouble? Our service has a simple, legal purpose—that is to provide our customers with a model that they can use as a learn-by-example guide in completing their own essay. We take plagiarism as seriously as we’re sure you do—and as seriously as all educators do. We expect our customers to show us the same regard: if our customers choose to use a passage from our work in their papers, we anticipate being given full credit with a proper citation to our work as their source. So long as you cite your sources, you can never be accused of stealing from others or passing someone else’s words off as your own. So long as you use our service the way it is intended, you cannot get in trouble. Indeed, courts have shown this to be true. Should I be worried? Absolutely not! We service thousands of brand new clients every semester, many of them coming back again and again for more assistance. The fact is many students find our approach to education to be very helpful. Since each essay assignment comes with its own set of terms, seeing a model essay written according to those terms can be a great way to better understand how to write your own. Before you go to build a house, a car, or anything else, you look to see how others have done it first, don’t you? The same principle applies here: we just show our clients how we would write the paper if we had those same directions to follow that they have. Seeing things through another person’s eyes can make all the difference! What kind of students use this service? All kinds! We serve students at every level—those pursuing an Associate’s degree, a Bachelor’s, a Master’s, and even those working towards their PHD. As a matter of fact, we get a steady stream of clients from every level of academia, which indicates to us that writing really is a lost art. When something is lost, you call in the professionals to help you find it. That’s why we’re here. We’re safe, effective, and focused on quality—and for those reasons, we’re the #1 provider of model papers for students around the world. Why is this service so expensive? Other sites seem to offer the same for less! You know, the old adage is true: you get what you pay for. Our service is commensurate to its cost for all the reasons we’ve just stated: we give our clients an original, one-of-a-kind document that is constructed according to their precise directions and written to meet their unique needs. If you want a car that is custom-designed, you’re going to pay extra for it. Same with a house—and same with a model essay. Sure, other sites will offer you the same “service” for less, but they’re not providing the same quality. Sites selling term papers or offering term papers for sale are simply reusing old essays that have been distributed through the system so many times students who use them run the risk of facing severe penalties if they are caught. Every single one of our essays is a unique paper that has never before been seen by anyone—except you: and it is yours to use as a guide when you go to write your own paper. We don’t recycle papers the way other sites do. (Type in “buy term paper” and you’re sure to find one of them.) The Internet is filled with sites where old essays are picked for scraps, the same way car parts are taken from junk yards. We’re no junk yard. We’re a fine-tuned production line where brand-spanking-new papers are produced upon request just for you. If that doesn’t scream quality, we don’t know what does. Is my information safe? Of course it is! We wouldn’t be here if it wasn’t. We use an SSL connection with 256-bit encryption for every order processed: that means your CC info and your billing info is safe from being stolen. We don’t store any of your personal information on our servers—so once it’s processed, it’s flushed out of the system and there is absolutely nothing left for hackers to take. Why should I choose you? If you’re not convinced yet, consider this: a lot of sites out there employ foreign writers (at a cheaper rate—it’s called off-shoring!). We don’t. Our writers are right here in the USA. (Buy American, Hire American—right?) We’re a registered corporation in New Jersey and in Florida. We’ve been in business since 2003 and we work only with writers who’ve attained their own Master’s degrees. Our writers are native-English speakers who have a tried and true understanding of the rules of English grammar. And we have an A+ Better Business Bureau (BBB) rating! What more do you need? If you’re stuck and need help, let us help you. Order today. Other than writing model essays, what other services do you provide? We do it all. Our writers can design Power Point Presentations, resumes, cover letters, business proposals, theses, capstone projects, dissertations (complete or partial), research papers, personal narratives, statistical analyses, formal announcements, college application letters, and much, much more. Our writers thrive on doing new things—so even if you think your needs are so far out there that no one will want to tackle them, give us a try. So now you know all there is to know. What’s keeping you back? The road to excellence is not one that’s taken alone. Even Dante had Virgil for a guide when he went through the Inferno. Why not take on a guide for your own needs right here on Earth? You’re stuck—and we’re in the business of making people un-stuck. Place your order, upload your instructions, give us your deadline, and we’ll connect you with a writer who will get to work on your model essay. You’ll be given direct access to the writer, who will be more than happy to answer your questions or get in touch with you to clarify any points that may need clarifying. Our writers do this job professionally—just like a furnace repair man works on furnaces professionally. Our writers’ certification is contained in the degrees they themselves have earned, and their ability to deliver quality model essays to clients is observed by us day in and day out. We don’t employ slouches. Slouches fall down on the job. Here, we get the job done. Your own personal model term paper is just one order form away. Within hours, you could have your own personal writer doing research based on your specifications, uploading a customized paper that will show you a great way to approach your own essay as you get closer and closer to your deadline. Think of Dante! Think of how Virgil showed up to help the master poet of the Middle Ages shine a light on the correct path through the fiery depths of Hades. You’re in a similar situation: the walls are closing in, and you’re already shouting for help! We have the tools, the skills, the know-how to get your essay back up and running. Our writers do this every day for students from every discipline. Your term paper is due and you need help. You’re working against the clock to get it finished but you’ve barely cracked the surface on your research and you’re not even sure whether your thesis is up to snuff. You’re looking for solutions—that’s why you’re here—but you don’t know whether you’re on the right road. By their fruits you shall know them: so consider this, we’ve been bearing good, solid fruit since 2003. Our writers have been helping students all over the world. Our aim is to supply you with the customized, model essay you need to get you up and running again. Not every student knows how to see a project through to completion. Sometimes students need a guide, an example of how an essay might flow or hang together—a path that will enable them to conduct their own research. It’s not cheating: it’s called education. It’s called getting an example of how the real thing is done. It’s no different from looking up on YouTube how to build a second bathroom in your house—except we show you how to do it with your precise parameters in mind. Our writers communicate directly with our clients and are on top of things from the word go. If you want success, go to those who can help you achieve it. A term paper should serve as the culmination of what you’ve learned throughout the course. Use the texts given from your class in your paper and as a springboard for your own research. Use our model essay as an example of how to construct your own. When in a tight spot, ask for help! Contact us today! "Best Term Paper Writing Service (since 1998)." Aceyourpaper.com. Student Network Resources Inc, 24 December. 2017. Web. 19 April 2019. Student Network Resources Inc. "Best Term Paper Writing Service (since 1998)." Aceyourpaper.com. 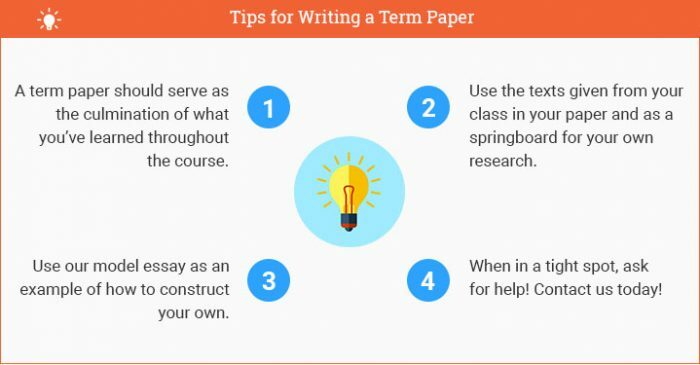 https://www.aceyourpaper.com/writing-services/term-paper-writing-service/ (accessed April 19, 2019).